The large box shows several episodes from the Russian folk fairy-tale "Sivka-Burka". It tells about the adventures of the youngest of three brothers, Ivan the Simpleton. For his courage and easy temper, his father presented him the magic horse, Sivka-Burka that was ready to serve Ivan. With the help of Sivka-Burka's magic powers, Ivan managed to jump to the highest tower in the king's palace, where the king's daughter was standing, and take the ring she was holding. This made him the victor in a contest, and for performing this feat he was allowed to marry the tsar's daughter. The left upper corner shows Ivan lying on the stove, and speaking to his brothers. His finger is bandaged as he tries to conceal the ring of the tsar's daughter he has won during the contest. The right upper corner features Ivan and his magic horse, Sivka-Burka. The rest part of the composition displays Sivka-Burka with Ivan sitting on his back, giving a magnificent leap, high up into the air. 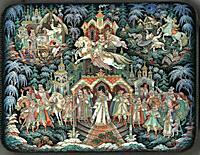 The magic horse reaches the balcony where the princess stands and Ivan has time to take her ring and even to kiss her. The tsar and all people of the kingdom open their mouths with amazement. Ivan is a winner, and now the princess must marry him. The composition is painted in the unique Veselov's style. Gold paint is used to enhance the already intricate detailing and bring out the true power of the palette. Here the artist has managed to find place for more than thirty human figures, complex medieval architecture and detailed landscape that proves his talent of a skilled lacquer miniature painter. Gold and silver beads frame around the lid's artistry. The box sides are decorated with intricate gold and silver floral ornamentation accompanied by a string of gold and silver beads. The box is made out of paper-mache. Black lacquer covers the exterior and red lacquer covers the interior of the box. A hinge has been fastened to the top of the composition, and the box rests flat. Veselov has written the title, Kholui, 2015, and his name at the bottom of the composition. He has written the same on the interior of the lid.